On the heels of five major theme parks in as many days, today was billed as a rest day at one of the areas newest water theme parks - Aquatica from Sea World. It only opened this March and with the weather playing nicely, it promises to be a nice day out. One of the unique features of Aquatica is the option of renting a private cabana for the day. These are three-meter square tents that come complete with a ceiling fan, refrigerator (stocked with drinks), locker, towels and lounge chairs. At $150 + tax, they certainly aren’t cheap but since this is likely to be a one-off, I thought we’d bite the bullet and see if we could reserve one. As cabana renters, we’d also be entitled to 20% discount at all the shops and 10% discount at all the food outlets throughout the park so we were likely to crawl at least some of the expense back. I went online to see about booking one but you had to do it two days in advance. I tried my luck over the phone but despite my best persuasive attempts, they wouldn’t allow me to reserve one until we were at the turnstiles. The woman did eventually call through to the front gate to verify that there were some still available. There are eighteen in total throughout the park and only four had been reserved so far. Since breakfast was such a success yesterday at the Golden Coral on highway 192, we detoured over to there again today to fill our tummies ready for the day ahead. The car was loaded with the now familiar array of drinks, juices, fruit and all the other required theme-park-trail-paraphernalia but today with all the swimming necessaries also. The car park at Aquatica was largely empty. We later learned that today was to be a very quiet day with only around two thousand park visitors. Some of the attractions only had half the number of flumes open but the queues were still practically non-existent pretty much everywhere. At the guest relations desk office, we made booking our cabana the first priority. We had no trouble getting one but it would have been nice for it to be just a bit closer to the kiddies play area. The cabana itself was actually quite nice and the luxury of the fridge and shelter from the sun (not least of all so that the kids could take a nap in comfort and without us having to worry about them) was very welcome. Still, at the price they charge, it definitely pushes the boundaries of acceptability and worth. After settling into the cabana, we got the kids changed into their swimsuits and we all duly layered ourselves with the mandatory suntan lotion. A nice little touch was a free bottle of suntan lotion that came with the cabana. Naturally, we took the kids first over to the younger kiddies play area, where Joey wasted little time in getting into the spirit of things, whilst Jennifer took considerable more time to get comfortable in the water. We spent the better part of an hour or two playing around in the shallows, with the various water-spurting gizmos and all the various slides. Jennifer did get into the swing of things eventually but both of them were exhibiting the usual signs of tiredness so we made our way back to our cabana so they could have a nap - which they did in their respective buggies for a good hour. There are two separate ‘rivers’ at Aquatica. One is a fast moving river and the other a slower moving one with inner tubes. Both were very good but the water temperature was just a tad cold for both our liking. Despite this shortcoming, I’d have to conclude that this is a better water park than Blizzard Beach or Typhoon Lagoon. We took the kids on the fast river, which they enjoyed by and large, and then onto the second kiddies area, which is a large area of walkways, slides and sort of a scaffold-looking climbing area that has dozens and dozens of hands-on wheels, buckets, hoses and other means by which people walking below, around and above you can be soaked, squirted or gushed with water. It’s a similar idea to the water play area at Universal Studios but on some serious steroids. It’s actually more appropriate for slightly older kids and since Jennifer doesn’t like being dowsed with water she really didn’t enjoy it a lot. Joey was borderline for parts of it but enjoyed most of it nevertheless. Towards the later part of the day, I took Joey on one of the larger flume rides in a double inner tube. Despite the look of sheer terror across his face, he did confess to liking it afterwards. 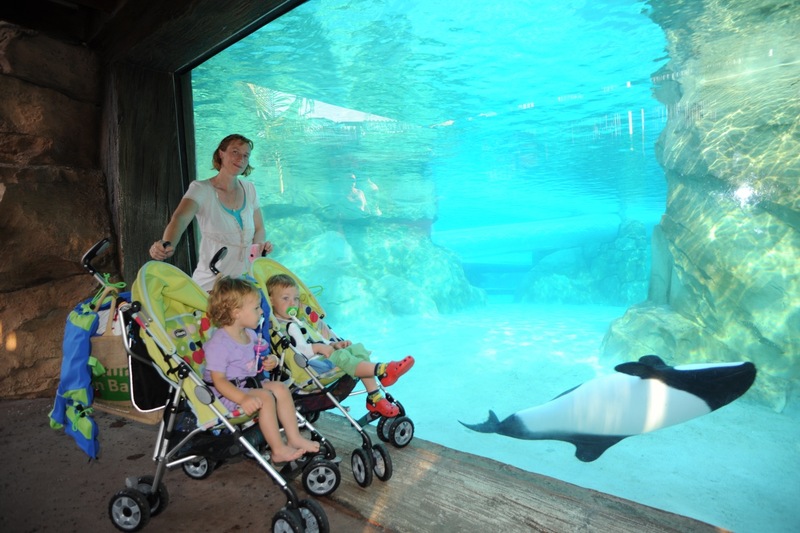 One of the bigger flume rides involves sliding through a clear section of tubing that runs through a large salt-water aquarium in which several small black and white dolphins swim around. ￼The idea is that you can see the dolphins as you rush through the slide but you go too fast and have water in your eyes so the effect isn’t that great. There are some nice viewing screens, however, through which you can see the dolphins swimming about which the kids loved. By now, the sun was getting lower in the sky and it was getting a little bit chilly being wet all the time so we made our way back to the cabana and packed up our things ... and kids. I picked up a couple of new pairs of swimming shorts on the way out and we headed off home for a slightly earlier than normal close to the day. I ended up just a little bit sunburnt despite having applied my suntan oil a couple of times. We have to get up early for tomorrow morning’s character breakfast at Animal Kingdom so it was a good thing that we ended our fun in the sun a bit earlier than normal. We didn’t take nearly as many photos today as we have been doing (around 50 compared the typical 200-300 we’ve been averaging) but it’s difficult to mix photography with water. It seems that the wide-angle lens that I’ve been using has a bit of grit lodged inside it and this is visible on many of the photos. We think this is the result of the buggy falling over on top of it at the Magic Kingdom yesterday so we’ll have to see whether this is insured when we get home. I’ll take the zoom lens tomorrow instead, which is probably better anyway considering it’ll be animals all day long.